Beautifully mirrored in Hourglass Lake, this home was designed to reflect the elegance of an old, Italian villa positioned on an oversized lot with more than an acre of lush, manicured gardens. Globally sourced materials, including medallions of ancient terracotta, marble and granite retrieved from the same Vatican quarries outside Rome. Down the brick-paver driveway, through the honed-marble framed front doors, you are welcomed by Jerusalem limestone and a sweeping custom wrought iron crafted staircase. Overlooking hourglass pond is the kitchen encompassed by a great room, dining room and a breakfast nook and bar. The bathroom features beautiful ceilings, dual vanities, showers and his-and-her water closets, and leads to a private bath and Jacuzzi located on the outside terrace and garden area. The covered breezeways run from the main house to the five-car garage and golf-car garage. Nestled in the backyard is a 12-foot deep pool with spa, half-basketball court and summer kitchen. A walkway leads to the guest house, which includes a living room offering lake views and large bedroom with two king-sized beds, beautiful wood doors and a walk-in closet. 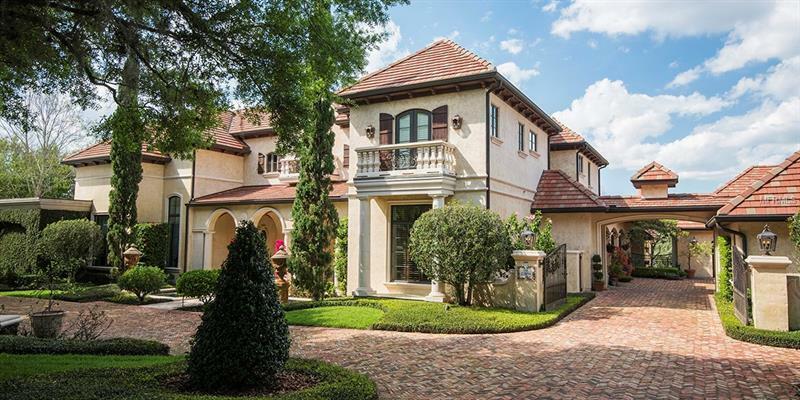 Gracious living at its finest, this home offers a theater and billiard room. Additional unique features include Jacuzzi tubs in all bathrooms, a rose garden, fruit trees and a security system. Important works of art and select furniture may be available. Additional Water Information: Hourglass Lake is a landlocked body of water situated between Holes 12 & 13. The Isleworth community is set along the Butler Chain of Lakes and offers a private community boat ramp with concierge launch service. Amenities Additional Fees: Club amenities are available to Club members only. Residents of the community are not required to join the Isleworth Golf & Country Club. Builder Name: Pellegrini Homes, Inc.
Pet Restrictions: Per Orange County breed restrictions and leash laws.